As we at Apologetics Press have endeavored to stay abreast of the latest developments in mass communication and publishing protocols, we remain vigilant in our willingness to consider and adopt any legitimate medium that will aid in furthering the cause of Christ. Since our prime directive continues to consist of defending the Christian faith and imparting spiritual truth to all who wish to receive it, we are excited when we are presented with new ways of packaging that truth in an effort to be more effective in our outreach. 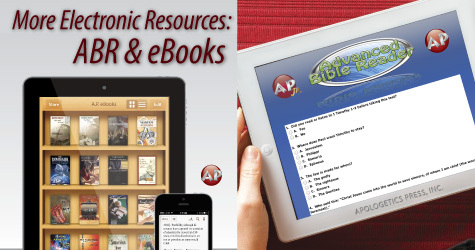 We are pleased to offer a tool to the public that we think will be extremely useful: Advanced Bible Reader (ABR). The purpose of this tool is to encourage young people ages 5-13 to read the Bible, thereby encouraging them to learn God’s Word and increase their comprehension of His will for their lives. The Advanced Bible Reader program aids young people in their study by offering them a unique learning experience. The program is free of charge and has been designed simply for the purpose of offering an incentive to read the Bible. It is open to all who would like to become students, but is designed primarily for those in kindergarten through the sixth grade. Young readers can go to our Web site, click on “Advan. Bible Reader,” and create an account with their own username and password. They may then begin taking tests to measure their reading comprehension, accumulating points in the process. The students will be able to easily keep track of their points, which tests they have taken, and what questions they answer correctly or incorrectly. Teachers may use the site to monitor their students’ grasp of Bible passages. Another excellent resource that we now offer through Apologetics Press is the availability of eBooks. Large numbers of people now do most or all of their reading via electronic books that they download to their electronic devices (iPads, etc.). We presently have 18 A.P. books at our Web site Store available for downloading—priced far below the hardcopy version. You are encouraged to visit our site and peruse available books today.